The Guardian has put together a special Travel issue dedicated to camping: find out about Britain’s best tiny campsites which are never crowded, island camping and some remotely located campsites. Read and be inspired to start planning your next camping trip in wild Britain. The location is hard to beat – a few minutes walk from Wastwater, England’s deepest lake, and at the foot of Scafell Pike, England’s highest mountain. Wasdale campsite is in a perfect location for walkers or those simply looking to escape crowds and trappings of civilisation (no mobile signal). Good facilities and friendly staff. More information at the National Trust. Campsite in Snowdonia National Park with fabulous views of the Mawddach estuary and Snowdonia mountains. Graig Wen, near Dolgellaux. Graig Wen promises “an inspirational, back to nature experience”. Perfect for walking, bird-watching, mountain-biking or visiting the area. Traditional small farm in the hills of Mid-Wales. The site offers veggie Bed and Breakfast, Camping and a Self-Contained Caravan. Goats, chickens and sheep wander about and there is a large vegetable garden grown to organic principles. Beautiful views of the mountains of the Snowdonia National Park, and on the Cambrian Way, Dyfi Valley Way and the Glyndwr’s Way National Trail. The camping site is in a wild area near the lake. 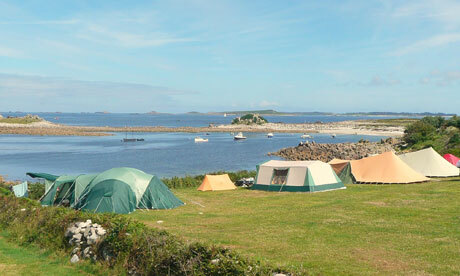 The Guardian has put together this exciting list of the best the campsites by the sea in the UK. Some of these are remote sites visted by dolphins and other wildlife. Lots of breathtaking views.